Welcome to Fulltime RVing the place for full-timers to socialize, share stories, chat about camping supplies, repairs, safety, cooking, travel, RV jobs, frugal living and much more. Come on in to read & share the best tips, resources, and inspiration for wannabe's and veteran Rvers alike. This website is all about the community of full time RVers sharing experiences and providing information to others about our RV lifestyle. Share your RVing adventures in our Full Timer's Stories Forum or share a picture of your rig in our Users RV Photo Gallery. 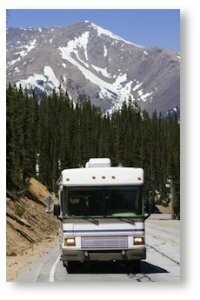 Fulltime Rving is the term used in the motor home & trailer world for people who live in a Recreational Vehicle. The RV lifestyle is popular with retirees, and those whose jobs relocate often such as construction or contract workers or people who just want to simplify their life. Since we started Fulltime Rving we have met and learned from countless others who enjoy this simple lifestyle. We want to share with others why we love it. Read on and see if you're ready for full-time RV living. We think living in a Recreational Vehicle is a wonderful life, but it isn't for everyone and you should consider some things when making this life changing decision. Should you sell your house? Depending on your personal situation this may be a tough one. Can you afford to keep it? Does it have sentimental value as well as monetary? We chose to sell ours and live only in our RV. This decision can be liberating! What about all your stuff? Again, only you can decide what has value to you and what you can live without. In our situation, the more we tossed the more we wanted to toss. It was addictive to keep clearing clutter from our home and our lives. 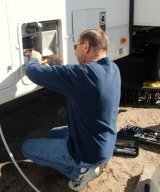 Can you afford Fulltime Rving? Many people think it's an expensive lifestyle, and it can be if you buy a fancy motor-home, travel constantly, stay in all the best resorts, and eat out all the time. Many people enjoy Rving without breaking the bank though. There are very cost effective RVs available that can be considered when selecting an RV for full-timing. 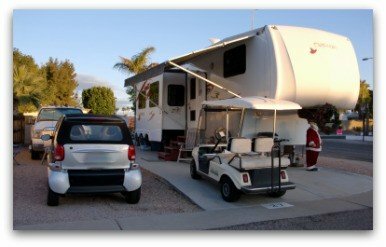 There are countless RV resorts that are beautiful and inexpensive. Consider your budget, and if will you continue to earn income or not. What will you do when you reach an age that you can't travel anymore? There comes a time in every full timers life when they travel less frequently and maintain a more traditional residence. It can sometimes be due to health issues, aging, wanting to be close to relatives again, or any number of things that occur. That doesn't always mean selling your RV and buying a house again though. Many find a park where they want to stay indefinitely and still enjoy life without a house. Where should you establish your home base when Fulltime Rving? Rvers' are lucky, they can domicile in any state they wish. Your choice should be based on how you will full-time. Do you plan to work a full-time job? Meander, or will you have purposeful travel? Read our selecting a state for domicile to help you consider issues such as health insurance, voting, vehicle insurance, income taxes, and more. Anyone considering this lifestyle should check out the many resources available to them. Think about trying it for a month before you buy with an RV rental. Educate your self, and then weigh your options. You can create the lifestyle you want. Life is an adventure so; young, old, full-time Rving, or part-time, it's always a good-time for Rver's.